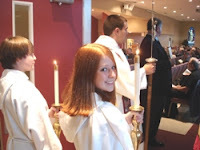 One of my favorite activities at the end of worship is to anticipate the adventures of acolytes. (book to follow) It’s impossible to predict what they will encounter/manufacture as they approach the candles during the last verse of the last hymn, transfer the flame to their candle-lighter, snuff the candle and then process out in front of the pastor. These are elementary school students, coached by a parent. They are cute as can be in their white robes and clunky tennis shoes. Sometimes siblings serve in pairs and it's clear that for some brothers it makes a difference to finish far ahead of sister. Sometimes an over-eager acolyte will put out both candles and disappear from the chancel leaving the partner high and dry. Sometimes the wick will be pushed out too far and the candle-lighting device will sport a much too big flame. Sometimes the hymn is short and their duties can't possibly be completed before the singing stops. The benediction waits. Last Sunday I anticipated a new anecdote for my catalogue of misadventures when I noticed that one of the lectern candles was out for most of the service. What would these kids decide on the fly? How would they work it out? To my delight they nailed it. The girls both approached the lit candle, in turn they lit the wicks of their candle-lighter, then the second girl put out the candle and they turned and processed out the middle aisle. It put a smile on my face. Children solving what I hadn’t figured out. In the afterglow of Thanksgiving I love having additional reasons for gratitude and hope. Forgive me for being weary of our culture of me-firstness. I’m thankful for Jesus’ devotion to children. Could it be that he taught these girls a Kingdom lesson before adult "values" could interfere. God is God - of the big and little. Big and little people – big and little events. Thanks-giving is a political act. On the other hand, a Texan might place the first American thanks-giving either in Palo Duro Canyon in 1541, with the Spanish explorer Francisco Vasquez de Coronado and Teya Indians as participants, or somewhere along the Rio Grande River in 1597, with Spanish explorer Juan de Onate, Native People of that region, and Franciscan missionaries. What those thanks-giving celebrations have in common is that they followed weeks or months of hardships. In Texas and Massachusetts, many had died of starvation or thirst. What too often gets ignored is the myriad ways in which Native Peoples of all tribes had given thanks on this land for centuries before any Europeans showed up—and the cost to them of the arrival of the Europeans. We would do well to remember that the names of Plymouth, Berkeley, Palo Duro, and Rio Grande are European names, not indigenous ones. Thanksgiving is a political act. At the urging of Congress, George Washington declared a national day of thanksgiving in 1789. In the early 1800s, Sarah Josepha Hale, a New Hampshire writer and editor, urged the creation of a national Thanksgiving Day. In 1863, in the bleak middle of the Civil War, Abraham Lincoln proclaimed such a day—though it was not until 1939, under Franklin Roosevelt, that Thanksgiving was set as the fourth (rather than the last) Thursday in November, ostensibly to help retailers by adding a week to the Christmas shopping season. Thanksgiving is a political act, and any statements about the things for which we give thanks are political statements. I give thanks for my food; I have money to purchase it and transportation to stores that stock fresh fruits and vegetables. I give thanks for my health; I have insurance to help pay for good doctors and the medicines they recommend. I give thanks for the roof over my head; unfair mortgage practices have not cost me my home. By some reckonings, the average salary of an American CEO today is as much as 185 greater (or perhaps even 325 times greater) than that of the average worker. I wonder what things will make the thanksgiving lists of those CEOs this year. What about those who have lost homes, or jobs? And what about those in the Occupy Movement? What will they say this year when they give thanks? I have to admit that they too are on my list. I give thanks for them, for their non-violent witness and for the ways they have spoken truth to power—and money. Thanksgiving is a political act. It is also an economic one. And so as Thanksgiving approaches, surely it is right to take stock of our blessings, both individually and as a nation, and to offer God our grateful hearts. But here is my prayer: that out of our gratitude will come not only words but also a more equitable sharing of the resources with which God has blessed us—so that thanks-giving can become a more equitable political act. Coaches are in the news these days for all the wrong reasons. We are sickened and angry to hear about the coach at Penn State who betrayed the trust of some young boys. It is easy to feel cynical and even suspicious about coaches these days. Moral courage is what sustains the basic freedoms and responsibilities of life in community; we belong to each other; we need each other; we affect each other. What is painfully missing in this horrific story at Penn State is the lack of moral courage displayed by men who spent a lifetime in education, leadership, sports, coaching and working with young people. Courage can be divided into two types: physical and moral. Of the two however, physical courage is the more recognized virtue in the world of sports. Coaches talk about physical courage, encourage it, and hold up examples to the team often in the context of fighting through injuries, rehabilitation, and pain. There is far too little emphasis, teaching, modeling, nurturing and developing of moral courage. Masculinity, first and foremost, ought to be defined in terms of relationships. It ought to be taught in term of the capacity to love and to be loved. At the end of your life, it is going to come down to this: What kind of father were you? What kind of husband were you? What kind of coach or teammate were you? What kind of son were you” What kind of friend were you? And I think the second criterion—the only other criterion for masculinity—is that all of us ought to have some kind of cause, some kind of purpose in our lives that’s bigger than our own individual hopes, dreams, wants, and desires. At the end of our life, we ought to be able to look back over it from our deathbed and know that somehow the world was a better place because we lived, we loved, we were other-centered, other -focused. Even in this discouraging time, I am thankful for coaches. I am grateful for the people in my life that took the time to be my coach. I am grateful for the coaches that today take the time to lead my son and daughter. And I am grateful for people like Joe Erhmann for whom coaching is a call with a larger mission than to win games. Who was your favorite coach? Knitting is an art, a craft. You need some mathematical ability. You need to have some dexterity. You need to have good eyesight. And, if you don’t knit, please consider this some life lesson, substitute the word “crochet”, “weaving”, “woodworking”, or whatever other craft you do. Last spring, I was given an opportunity to purchase a book in honor of Administrative Assistant’s Day from a certain publisher. I chose a book I’d been drawn to called, The Knitting Way, by Linda Skolnik & Janice MacDaniels (Skylight Paths Publishing, 2005). When I received the book, I allowed it to take me on its journey through the patterns. “Knitting keeps me sane.” As one who is ADD, I bring my knitting everywhere. It helps me focus and concentrate on the speakers and conversations. And, I suppose I knit for sanity, for stress-relief. Can you be upset when you knit, while you knit? Stressed out about events happening around you? Think about that. How connected do you feel when you knit? With your past, connecting to your present, connecting to your future. When you are thinking the stitches involved in an intricate pattern, turning a heel, or purling & knitting when you should be knitting and purling, how can you be stressed? A few years later, one of the women in our church began a Shawl Group. It began as a spiritual group, beginning in silence and meditation, with a reading, and just knitting for a while. The shawls would be given to parishioners who had lost someone, who needed just that bit of comfort in their lives during a tough time. And, so we continue with our shawls. Not in silence, and not always together after the service, sometimes in our homes, out in public, and usually in church. I feel the connections we make in church through our knitting, whether we knit in a group, or in our homes, make us stronger, build a better community, sharing skills, patterns and yarns. We recognize the need for someone to take care of themselves with the finished project as we pass it on. In that way, we connect our spirituality in the work we do. The colors and textures can be luscious. I’m reminded of sunrises, sunsets, mountains, rocks, flower gardens, oceans…I love perusing yarn shops. When I pick up a skein of yarn, I am awed that I can turn this beautiful yarn into something wearable, something usable, and something beautiful. My heart flutters a little. When I mentioned to someone about writing about knitting, they said to be sure to tell you that mistakes are okay. We learn from them. They can be corrected, but they don’t always need to be corrected. They can make our finished pieces interesting and creative. And, isn’t that the way life is. Is there anyone here who does not make mistakes? When you knit, you pick up from the last stitch you knit, connecting the yarn, row to row. And, on and on it goes. You connect the loops. Stories are told, occasions are celebrated and recognized. You are carrying on a tradition that is hundreds of years old. It is a craft passed down from generation to generation, within families, among friends. Connections: yarns to yarns. Connections: women to women, and, even between the sexes. Connections: community. How is it you connect your heart and soul to your community? 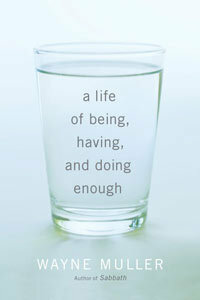 Wayne Muller has written a book with the intriguing title “a life of being, having and doing enough.” I’m suspicious of the grammar, and he doesn’t even capitalize the first letters in the title. (But readers of this blog will already know that he who is without sin casts the first stone, and I sin boldly when it comes to grammar.) Rather, it is the word “enough” in the title that has caught my attention. I think Muller has found one of those words that has layers and layers of meaning around it. It is a word that raises questions about my life, both practical and spiritual. · Am I working hard enough in my job? · Do I have enough money? · Am I doing enough for the needs of the world? · Am I praying enough? · Am I spending enough time playing with my kids? First, how do we know we have secured enough food, shelter, sanctuary, health and security for ourselves and our loved ones? And second, as members of our global human family saturated with unnecessary suffering and death, what is enough for us to do, to give to contribute? As we listen together to these challenges, I expect we will discover that these two basic human needs—to have enough and to do enough—live within us as two chambers of a single beating heart. When Jesus told us to love our neighbor as ourselves, he seems to be pointing to this same question: How do we balance care of ourselves with the needs of the world? How much is enough in either of these areas? Sometimes the needs of the world and within me feel overwhelming. Shortening the scope by focusing on the next right thing might well be enough.